First thing while making any Electronic Device we should consider is its controlling box should be classy. Let it be a Dark Green text Batch file or a Mad scientist Tube light Switch. In this Article we will show you how to interface the playstation Joystick to any other Microcontroller and use it for your purpose. A playstation Joystick has total 9 pins which are. From this we can see that the Joystick can be made to work on the SPI protocol. Atmega uC does have its own SPI but we will do it only by bitbanging. int data = 0x00;                             // clear data variable to save setting low bits later. }// bit bang "command" out on PScommand wire. _delay_us(20);                                                   // wait for ACK to pass. // poll controller and check in analouge mode. chk_ana = gameByte(0x42);            // the 2nd byte to be returned from the controller should = 0x73 for "red" analouge controller. gameByte(0x01);                                       // bite 0. header. gameByte(0x00);                                       // bite 2. header. data0 = gameByte(0x00);                         // bite 3. first data bite. data1 = gameByte(0x00);                         // bite 4.
data2 = gameByte(0x00);                         // bite 5.
data3 = gameByte(0x00);                         // bite 6.
data4 = gameByte(0x00);                         // bite 7.
data5 = gameByte(0x00);                         // bite 8. Hardware:The clk pin acts as a latch and while transmission we have to toggle it. Then we only must transmit our data serially through CMD pin and receive data at DATA line. first when we call configuration the header file 0x43 tells it to produce Analog mode in Joystick and after we have configured after sending the header 0x01 and 0x42 we have to simply send the 0x00 and receive the data serially from Joystick. Is it an Atmega32 microcontroller you’re using or is it something else? Either way, could you please specify the connections to the uC and also how do i rig it (as in what kinda code and what sorta connection) so as to enable me to use all the buttons and both the joysticks of the PS2 controller to control various motors/LEDs etc connected on some PORT of the uc? Okay, My bad. I just noticed that you HAVE mentioned the connections in your code (except for ‘vibration’ and ‘unknown’, but i guess i won’t be needing them), but i still am not sure where will my outputs be reflected if it connect this gamepad and press the buttons or vary the position of the joystick. i.e. i’m unable to figure out how do i read the Input from the Buttons and the joystick so as to give a specific set of outputs. i wasnt interested in the vibrations and generally unknown is not connected. If u want to add vibrate you can turn it on through transistor only. Just put the VCC 7.2 only. Hi. What frequency are you running? Did you use any resistors? Yes Atmega16. You can mail it to me right away. Ill take a look. 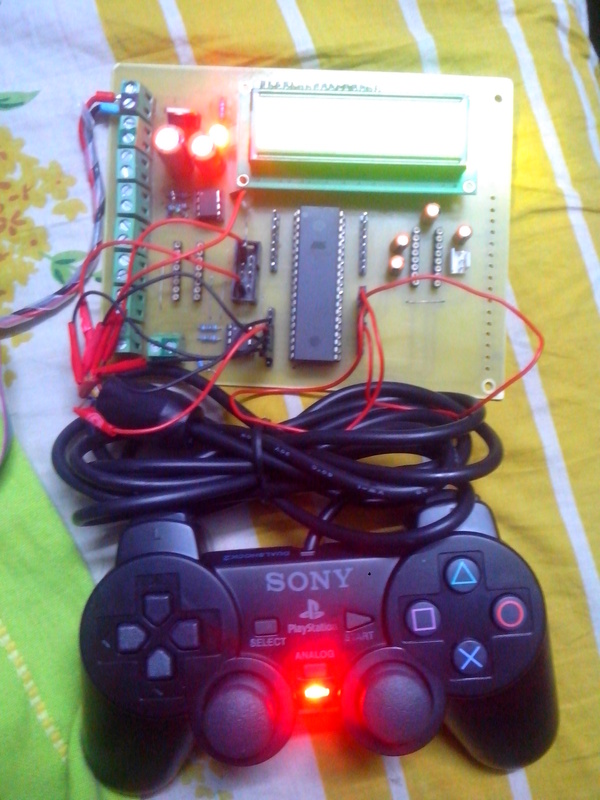 This entry was posted on July 27, 2013 by S4t4n in DIY stuff., Robotics and tagged Atmel AVR, Joystick, Microcontroller, Playstation Joystick, Programming, Universal asynchronous receiver/transmitter.